You’ve listened to your friends talk about their tattoos in imaginative ideation before the needles ever even penetrated their skin. Whether or not you’re donning tattoos yourself, you surely understand the personal significance that each piece holds. Like a good memory this ink should never fade. Whether decorated from head to toe or with just a few, when the sun shines down, layers of clothing are sure to shed leaving this ink exposed to harmful rays of the sun. We put this blog post together to educate our audience about shopping for the right skin care protection while using this opportunity to explain what makes our product Ink Guard, so special. 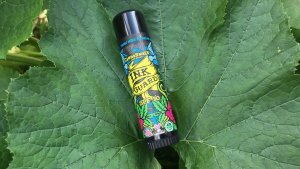 The formula for Ink Guard- SPF 30 was created by CannaSmack to help minimize color fading from tattoos due to sun exposure. Unscented, all natural, and cruelty free; what’s not to love?! The easy-to-use stick applicator allows full control over coverage while the incredibly light, silky formulation moisturizes skin without leaving behind any unwanted residue. This formula is “broad spectrum” providing both UVA & UVB protection which means you’re not only getting protection from sunburn, but also managing risks related to skin cancer and premature aging. Proudly enriched with premium Hemp Seed Oil this product provides offers an array of benefits bestowed by the cannabis plant. 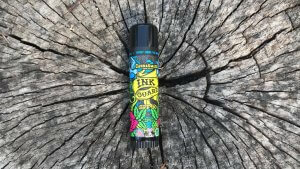 Ink Guard offers phenomenal protection that can be used regardless of tattoos. For instance, this non-greasy product works well for face, ears & shoulders! *Remind your friends to reapply often; according to the American Academy of Dermatology and the FDA that equates to at least once every two hours. Photo-degradation is the technical term for fading. Light absorbing bodies called chromophores are present in dyes. The color(s) our eyes interpret are based upon chemical bonds in direct correlation with the amount of light that is absorbed in that particular wavelength. Ultraviolet rays have the ability to break down these chemical bonds over time, therefore causing the colors to fade. You’ve likely seen this “bleaching effect” occur to fabric for outdoor furniture, or even a photo or sign that’s been on display in a sunny window for too long. 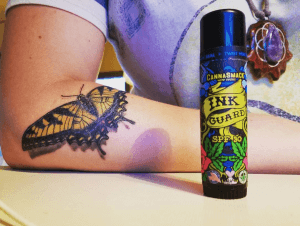 Though the exact chemical compound of the specific ink used for permanent tattoos may vary slightly from one another, (as this is determined by the tattoo artist’s ink selection), photo-degradation can also happen to the ink in our skin, when overexposed to ultraviolet rays from the sun. Collectively, ultraviolet rays from the sun are comprised of: UVA, UVB and UVC rays. The Skin Cancer Foundation informs us that both UVA and UVB rays can cause skin cancer, premature aging, sunburn and even eye damage (so don’t forget sunglasses)! UVC rays are short waves, stopped by the ozone layer, so no need to worry about those. The long-band, UVA rays are the most abundant, making up as much as 95% of the UV radiation that reaches the earth. Prevalent year round, at all times of day, UVA rays even have the ability to penetrate untreated glass – though you may be surprised to learn that UVA is not being accounted for in basic SPF sunscreens, (but we’ll get to that shortly). Even with such abundance, UVA rays are not the main culprit for the dreaded lobster-red sunburn. The sunburn-causing UVB ray is a medium wave. These waves are strongest spring through fall, between the hours of 10AM – 4PM, but still an all-day, year-round risk – as UVB rays come at you times two during the winter if reflected off of lots of bright white snow. The confusion on SPF runs wild, so we’ll try our best to put it simply: SPF measures the amount of UVB radiation a sunscreen blocks; but this speaks not to the product’s UVA protection. If you’re looking for full protection you need something that classified as “broad spectrum” which, according to the FDA means “the product protects against both UVB rays that cause sunburns and also UVA radiation that causes premature skin damage and aging.” The FDA says that a sunscreen classified as “broad spectrum” has a SPF rating that measures UVA protection in proportion to UVB, meaning: “a higher SPF value for sunscreens labeled “Broad Spectrum SPF [value]” will indicate a higher level of protection from both UVA and UVB radiation” allowing consumers to better manage risks relating to skin cancer and early skin aging. Quick Reminder: Hemp Seed Oil is extracted from a variation of the Cannabis Sativa (Hemp) plant which contains no THC, meaning there are no psychoactive properties; it won’t get you high. There is also zero CBD which means there’s no legal issues with sales and consumption. The benefits of hemp seed oil, are piled high. Naturally rich in Omega 3 (playing a role in brain function, aiding in preventing cardiovascular disease) & Omega 6 fatty acids (playing a role in promoting heart health by way of balancing cholesterol levels and improving immune function). Vitamins A, B, D & E work their magic alongside folic acid, (a type of B vitamin, helps the body produce and maintain new cells and also helps prevent changes to DNA that may lead to cancer), magnesium (amongst a long list of benefits relieves muscle aches and spasms), potassium and iron. Also, containing anti-inflammatory & anti-oxidant properties (may help reduce signs of aging), consumption of hemp seed oil is becoming much more common for such a wide variety of ailments including the prevention of heart & cardiovascular diseases, cancer, eczema, psoriasis, and acne. Hemp Seed Oil easily absorbed into the body via the skin, allowing its nutrients to renew and protect damaged skin cells. Even on its own, hemp seed oil can act as a natural sunblock! Tag us! We love to brag about you!